ANDRIY.CO - Working the cash register at the subsystem TCU Standard, mutual control of arrears. Working the cash register at the subsystem TCU Standard, mutual control of arrears. Despite the fact that TCU Start - this warehouse program, which takes into account all the usual trade operations, TCU Start no module Cashier. How important cash operation, what advantages they offer, what opportunities are being to the user? b) in the sale of goods form the expenditure invoice for shipment goods, cash receipt form and the warrant under which the buyer with we have calculated. It is also worth noting another important point. In addition to movement of money as a result of trade transactions, there is a class financial instruments, which need to track in accounting system. This is all the overhead costs associated with commercial activities. 4. All kinds of planned and unplanned expenses (maintenance, travel, petrol / diesel). The question arises - how to record cash operations, not just a bunch of common documents, a so that they can be clearly classified by a particular type. After a while TCU user wants to know how much money was spent, for example, from the beginning of the year for electricity, which amount was paid in the form of salary, as increased costs for gasoline, etc. The most reasonable solution - to have documents specific, clearly defined labels or signs, which can be select the documents they summarize and display the amounts form results. In TCU used for this purpose article of traffic (Tab «Directories» -> «Articles»). Open a directory of articles and type required us to become the movement of documents. In this example, depicted Directory of articles from the test database. Articles may be added or changed. Articles do not limited. Please also note that the article can be active or passive. Let's see what the difference between them. Wiring instrument with a given active section leads to a change in the amount to mutual counterparty, instrument cables with a passive section is not leads to a change in the amount of the counterparty to transactions. When and how Articles should be applied? If we pay for electricity - it is passive art. If we pay for travel - it is passive article. If we purchase goods - it is an active article, if We pay for shipment of goods - is also an active art. In fact, - Passive article serves only to simplify accounting. Ideal to pay for petrol on the active article (from the gas station in front of us a debt), income to take the invoice to the warehouse petrol (The gas station to pay their debts shipped to us with gasoline), then act of converting gasoline to cancel this residual (indicating the grounds on what purposes, to whom and where). To simplify accounting, we simply do payment of money at the gas station for gasoline (debit cash order) Passive article. Debt WSA does not change (as a rule, it is zero), we in turn, this gasoline is used. The fact that the purchase of gasoline and its confirmed by the use of cash expenditure warrant. Too respect and staff salaries. Staff entered into the directory Customer TCU, which is convenient to create a separate group of customers «Staff». They are being paid salaries for the passive section «Salary». Now, let's work papers, held on active object in the case of sale of goods. 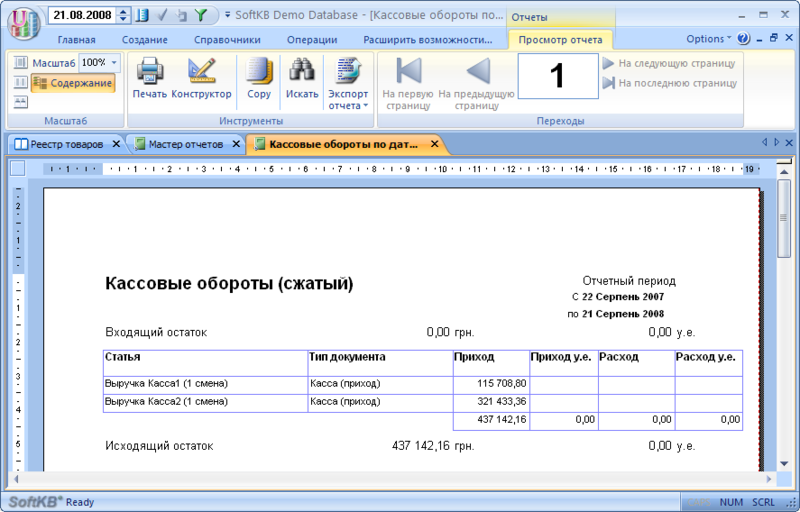 We form expenditure invoice indicating active Articles «Sale of goods» (the title of the article can be arbitrary, and described as an example), indicating the buyer. We carry out expenditure invoice, click on the icon «Payment» in content tab of expenditure invoice. It will be automatically created receipt cash order, which will contain all necessary information for payment. The amount of payment may be changed. Draw it on the same article «Sale of goods» (article may be specified, but it also must be active). In this event will be the buyer paid in full (if given the full amount of the invoice in cash order), or partially, if Kazana just part of the total invoice. Let's see how to make an analysis of our business activities in the article by section. Open «Master records» (Tab «Home» -> «Master records») and select the report «Cash revolutions», specify the filter Articles of interest to us. click on the button «Finish». The sample for any of the articles of traffic (you can specify several articles) will allow you to receive answers to many interesting your questions. Shops sell, the money in the cashier receives what occurs at the intersection of these two processes? We are gradually coming to the next interesting topic -- mutual. mutual - it's easy. To sell at 100 grn. Vaasa client paid us Vasya UAH 80, and 20 UAH. he us should remain. Do I have to TCU tracking customer debt take any special action? No, you do not. Arrangements with suppliers and buyers in TCU tracked automatically. Let's see how this works. add a new client in a directory (tab «Directories» -> «'s clients» -> «Enter new»). accents and details click on the tab «Data for the calculation ». On this tab, we can exercise control outstanding customer debt on time and in amount debt. a given period of deferment of 30 days, it would be impossible to ship the next invoice, if the client within 30 days is not paid arrears on a previous invoice. specify a maximum amount of debt, such as 1000 UAH., The operator will not be able to ship the consignment note, the amount of exceed 1000 UAH. Monitoring date and amount will allow you to relationships with customers and suppliers, under the clear control allows easy monitor the current debt and does not exceed the total permissible amount of debt for all customers in general. This is particularly true for companies engaged in wholesale trade on a deferred payments for deliveries. Let's try to ship goods to our client in the amount of 100 grn and to take into account this two-bill payment, 60 and 30 grn. To do this, create a new expenditure bill, drive the goods to 100 UAH and hold it. 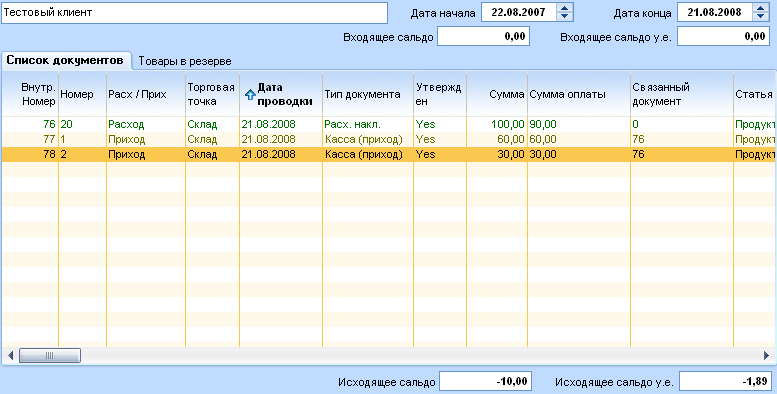 Once the bill done, click on button «pay». It will be automatically created and opened receipt cash warrant in the amount of UAH 100. Correct amount of UAH 100. 60 hrn. (I have no such client money ...) and draw cash order. 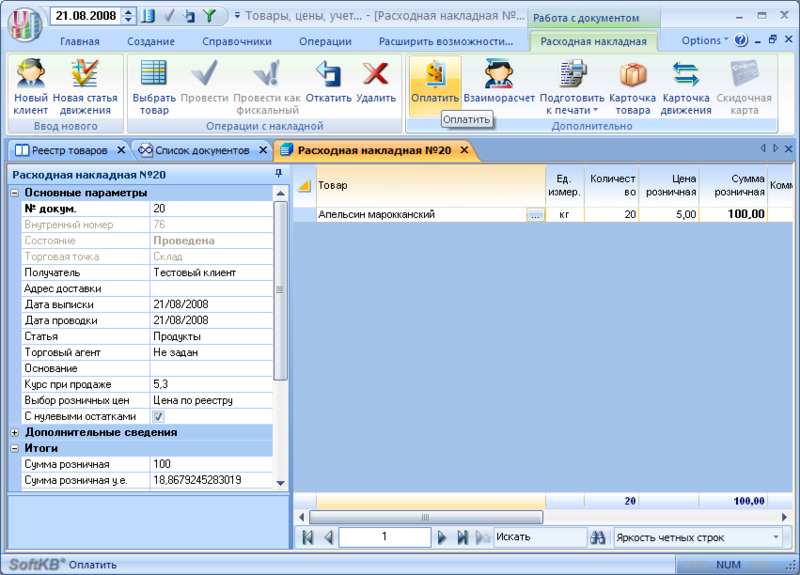 Back in the expenditure invoice and click again on icon «pay». This will create another receipt with cash order the sum of 40 UAH. (the remaining outstanding amount under this bill). Change the value of 30 UAH. and draw cash order. Now is the time to look at the card the customer mutual. There are several ways to open the card, the customer of transactions. In general tab «Home» Press button «mutual», a list of clients in which we choose the desired client and opens his card. In our case, there is much faster way. While in our spending bill, click on button «mutual». A card for mutual clients. Here we see all the documentary movement in the view of the customer. If there are any disputes, questions, comments -- All this is very easy to allow easy opening of the card. If the card need to print, this is easily done by clicking on the printer Content tab. By the way, you will never pay attention to «+» opposite each spending bill in the list of spending bills? Open the list of spending bills, to select our bill and press «+». disclose payments that are associated with this consignment note, against which they were received. Thus, we can see not only the total amount of debt the client, but the sum for each consignment note, as our overhead closure fee. Tell about all the possibilities of the system of payment and of settlements in this letter is not possible because of the restrictions on its length. Later SoftKB will regularly highlight topics of practical use TCU, as the accumulation of users, assess their importance and relevance.